Using magnifiers and special lighting. I mentioned magnifiers and lighting last time when I talked about spear cutting. It is important to get a good "invisible" joint in your veneers. A little time and effort coupled with good lighting and a decent form of magnification will pay dividends here. Good lighting will help to minimise shadows so that you will not get misled by the shadow formed by the edges of the spears (shown at right). These shadows fool you into thinking that your blade is following the line perfectly whereas you may be a blades width off. Another item that will help your accuracy is a powerful magnifying glass that is self supporting, preferably on a stand. 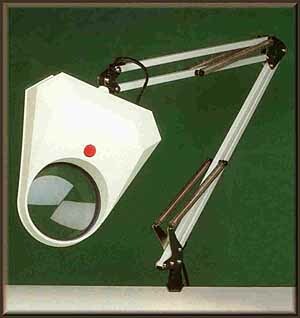 These lamps are available with the light source and the magnifying glass combined, as shown below. Some of the better examples contain a fluorescent lamp and can be clamped to your work table / bench. The one I use is counterbalanced, which allows me to manoeuvre the magnifying lens and light source to my best advantage. This all in one version places the light source directly above thework, ensuring a shadow-free area. Although I don't think it will matter too much in practice, I ought to mention the difference in perceived color between fluorescent and standard incandescent lamps. Both will do the job well, but the blue-green of a fluorescent light source often delivers a more natural color than the yellow of an incandescent lamp. The most obvious changes will be yellows and reds. Incandescent lighting tends to favour the warmer end of the color spectrum, whereas fluorescent lamps tend towards the cool. That cool bias allows us to get a slightly better match for our veneers. This mainly applies to lighter veneers, which may appear matched in the warm incandescent light but when viewed in daylight should be perfect. If you use fluorescent lamps when matching veneers, the picture will look just as good in the daylight. If you prefer to work with incandescent bulbs, you can get filtered daylight bulbs from speciaty art suppliers. I use these bulbs for indoor lighting when I am painting. Fine lines require a certain level of accuracy. 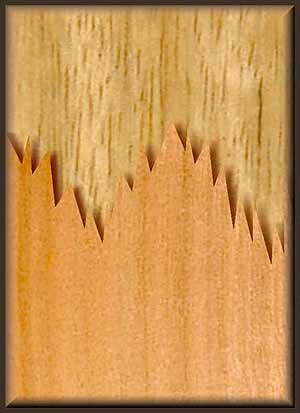 It really helps to be able to see easily where you are placing a single hair's thickness fine line in a slot you have cut in your picture. It is so easy to break off pieces of the fine line without actually realising it. It might appear that you have filled the slot with fine line but in reality, it is just the glue that you can see. Unfortunately, in normal lighting and without any magnification, you will think that you did a good job, but when you came to sanding the picture and applying a finish, the error becomes all too obvious. It's easy to get drawn into a false sense of security when fine lining if you don't have any visual aids. I discovered this problem the hard way, having to sand a picture back down through the varnish to the veneer layer. Once done, I then re-inserted my fine lines and had to varnish all over again! I have on occasion used one of those goose neck spot lights to illuminate a particularly tricky and delicate piece of marquetry work. The high level of illumination is very useful. 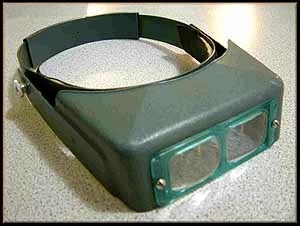 A useful adjunct to portable spotlights is a pair of magnifying spectacles. The ones I use look like a normal pair of spectacles. 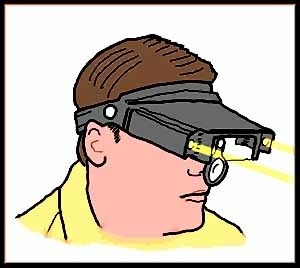 You can also obtain an all in one head band unit that incorporates a light source and magnifying lenses (below). It fits round your head like a croupier's green eye shade. One big advantage here is that the light source and the magnifying lenses are one, which gives you an unimpeded view of your marquetry, and will not obstruct you as you work. Or you can buy the magnifier on its own (photo at right). 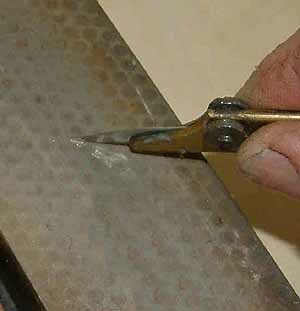 A useful bonus is that it's very easy to keep an eye on the quality of the cutting tip of your knife or scalpel blade. It's only the tip of the blade that we use, and when you are intently involved in an intricate cutting session a dull or broken tip can be easily overlooked. It is only when the blade really starts to "pull" and copious amounts of wax don't resolve the problem that we start to suspect the blade. I get so involved with my work that I don't realise the blade needs sharpening until I start splitting veneer instead of cutting it. I keep ten ready prepared hones and sharpened scalpels and Exacto cutting knives next to my cutting board, ready to take over when the blade I'm using starts to pull on my work. This saves me from having to break off my cutting to re-sharpen the blade (below). The most important lesson from today's talk is that a good light source is essential for accurate marquetry work. Even a small table lamp would be preferable to using nothing at all and although you may have very good eyesight, some kind of magnifier is a good investment to use in conjunction with your light source. It will prevent eye strain and possible optical problems later in life. I even wear my normal short distance glasses with my magnifier lamp. It makes the cutting line much larger and more distinctive, especially when cutting very small lines or shapes. Well, that's all there is in this 10-lesson course, and I hope you have enjoyed taking this little artistic journey with me. If you travel to the U.K., come visit the Redbridge Marquetry Group at our new home in Ilford (Essex) any Wednesday evening during the school term, between 7 and 9 PM.